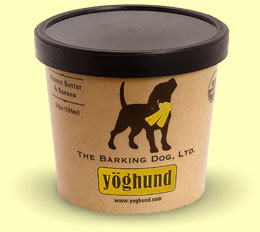 Yöghund organic frozen yogurt for dogs. Yöghund is a simple treat, made only with organic yogurt, banana, peanuts and spring water. It must be tasty, because instead of eating it they lick it enthusiastically. Available online from Yöghund, and at selected retailers listed on the site. Prices start at $6 for a pack of four, plus shipping. Hey! Nosotros tambien queremos!!!! justicia ya! Hoy cumplo 5. Festejamos con tiramisu de Nucha y me regalaron huesos, un freesbee y un tomate de juguete. Gracias a todos los amigos que me escribieron y me enviaron saludos. Milka dijo presente, como siempre. Nico me dio muchos besos.